I’ve neglected the blog for far too long, but to be honest, not much of note has made its way out of our kitchen of late. The most notable entries would include beef goulash with dumplings (made with leftover roast beef), pork loin braised in milk, and some saucepan mac and cheese with prosciutto, peas, white and yellow cheddar, and some garlicky toasted bread crumbs on top. I guess there were some pretty spectacular bittersweet brownies from Dorie Greenspan’s Baking: From My Home to Yours , but we ate those almost before there was time to photograph them. This is the sort of homey meal that sounds good to me this time of year. And it doesn’t hurt that I had everything on hand already in the house. I’ve made this recipe several times before, but it’s been a few years, I think. I pulled the kielbasa from the freezer to thaw without thinking about the extra hours’ boiling time, and since it was already after 6pm, I decided to skip that step. (I’m actually not sure what it is supposed to accomplish, other than perhaps defatting the meat a bit.) 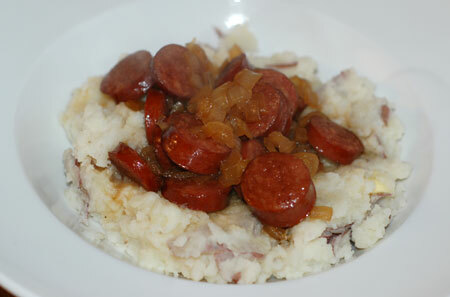 My sausage was light turkey kielbasa, and we didn’t notice any difference in taste or texture from the skipped step. Place sausage in a saucepan with water to cover. Simmer on low for 1 hour. Drain and set aside. Preheat the oven to 350F. In the same pan, mix Worcestershire sauce, lemon juice, onion, sugar, hot sauce and water. Bring to a boil, stirring. Place sausage in baking dish and cover with sauce. Bake for 1 hour, then serve with mashed potatoes.